Ideal product for sale in stores and markets in France and abroad. 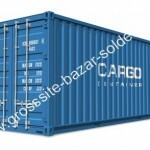 Our price: only 255 euros / per 10 pallets discount store. For any further inquiries, please contact our sales department at (33) 02 46 56 50 40 or e-mail . the shipping service can take care of organizing the delivery of pallets solderie semi-trailer and container for export destination. This entry was posted in Our clearance pallets, Tracking our items and tagged Import-Export. Bookmark the permalink.